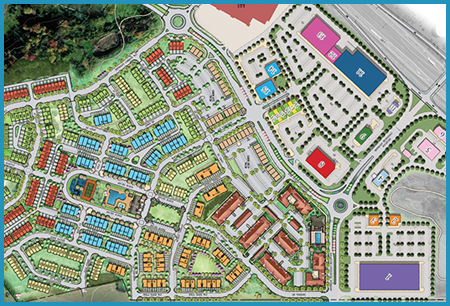 Jefferson Technology Park project is being developed as a mixed-use development on a 173-acre wooded site approximately four miles from downtown Frederick in Frederick County, Maryland. The project, marketed as Jefferson Place, is four miles from the Frederick MARC train station, 30 miles northwest of the Washington Capital Beltway, and has direct access to Maryland Route 180, along with U.S. Route 15/U.S. Route 340. The development is proposed to include approximately 2.56 million square feet of commercial and residential space, consisting of 798,000 square feet of office space, 192,000 square feet of retail space, a 175 room hotel, 230 apartment units, and a mix of 595 for-sale units. Upon completion, it is expected that Jefferson Technology Park will generate expected taxable value of $340 million. The project met county goals of providing employment based development connected to transportation links and population centers. The mixed use development also met county goals, providing an opportunity to people to live, work, and shop in proximate locations. The extraordinary cost to construct a state highway interchange, including a bridge over the interstate highway, warranted public participation. Special tax and tax increment bonds were instrumental in providing the required infrastructure for this major economic development project in Frederick County. In 2013, Frederick County issued Special Tax Limited Obligation Bonds in the amount of $6,640,000 as a limited public offering. Security for the bonds is solely in the form of special taxes levied on the property within the Jefferson Technology Park. In addition, Frederick County issued Tax Increment Limited Obligation Bonds in the amount of $33,360,000 as a limited public offering. Security for the bonds includes tax increment revenues and backup special tax revenues. Prior to the issuance of bonds, MuniCap, Inc. served as the financial consultant to the developer, preparing the TIF plan of finance, feasibility analysis, and special tax allocation methodology. Once bonds were issued, MuniCap, Inc. transitioned into the role of administrator to the Jefferson Technology Park Development and Special Taxing District. As administrator, MuniCap, Inc. ensures compliance with the Securities Exchange Commission and Internal Revenue Service regulations by preparing the required reports and documents. In addition, MuniCap assists Frederick County in determining the special taxes to be collected annually.